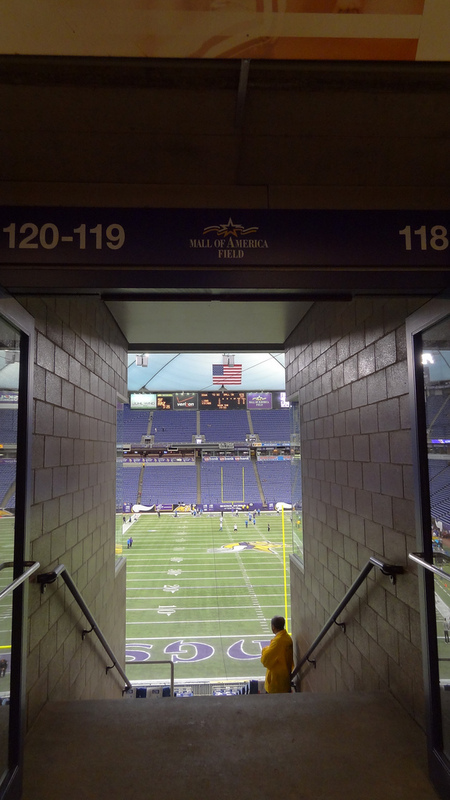 The Hubert H. Humphrey Metrodome, of all things, was my sports sanctuary for the entirety of my childhood. It was my home field. It was where I saw my beloved Washington Redskins triumph in Super Bowl XXVI against the Buffalo Bills. It was where I saw, on back-to-back nights in June of 1996, both Mark McGwire and Ken Griffey, Jr. launch home runs deep into the whiteness of the teflon roof (in fact Mark McGwire’s 475-ft shot was the longest to left in the stadium’s history). The first game I remember attending was a 22-21 Minnesota Vikings win over the Houston Oilers in a 1990 preseason game. I even saw Brett Favre play (in one of the worst games of his career) in his final season. All in all, I estimate taking in some 30 baseball games at the ‘dome. Yeah, I look cool, but you can’t tell how “cool” I feel…I’m absolutely freezing (and way under-dressed)! 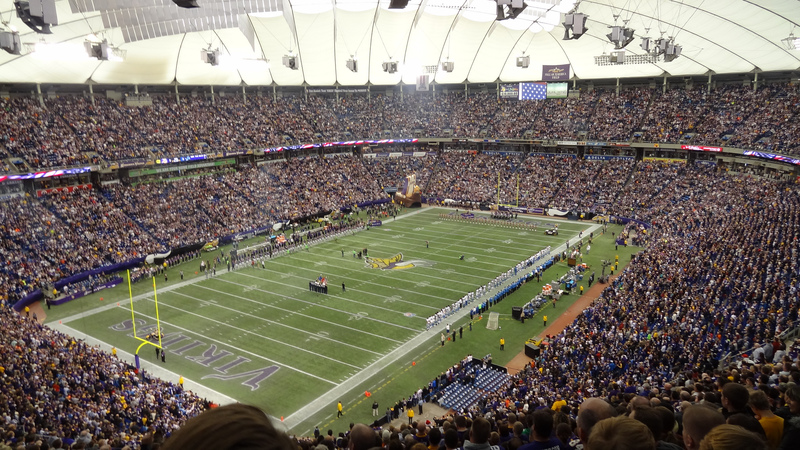 The Metrodome was long associated with being one of the ugliest stadiums of the last 10-15 years. It’s almost like the newness of it wore off right after hosting the Super Bowl in January of 1992. Baltimore’s Camden Yards (opening in 1993) ushered in a wave of stadium changes that continues to this day. Strictly speaking, the Metrodome got old, fast. To me, it was my ugly stadium. Actually, I never saw it as ugly at all. There was something cool and spacey about it, almost like being in some giant sports UFO. I’ll never forget the echoes of the PA Announcer, something that isn’t easily replicated in more modern sports stadiums. “Kirbbbbbyyyyy Puckett!”, “Chuuuuck Knobbblachh!”, and “Ron Coooooooomerrrr” will forever reverberate in my head. 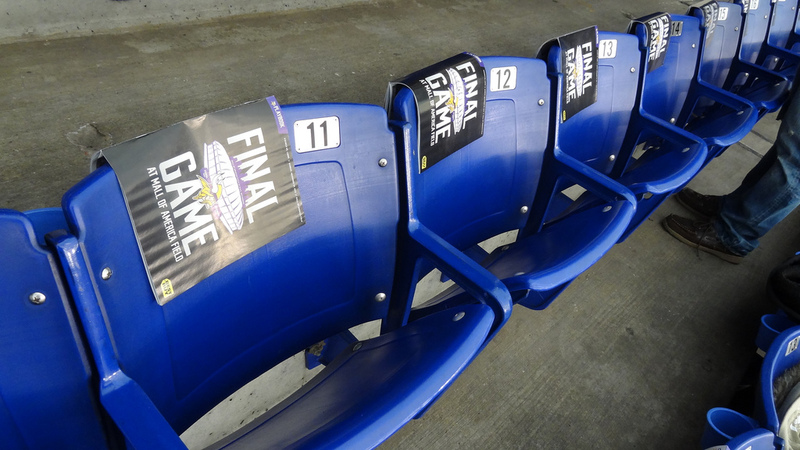 The final time these seats will have anyone in them (at least in the Metrodome at least). Oh, the memories. From leaving a 15-inning game early (and me complaining all the way back to the hotel – I told my parents I would never forget it!) to being at a sparsely attended Michigan State-Minnesota Gophers baseball game the day before Target Field opened (I attended that game as well). Funny thing is, I never was a fan of the Minnesota Twins. I never really had a baseball team growing up (I collected old Washington Senators cards with my dad, and am now as big a Nationals fan as there is) and in fact, I often cheered against the Twins! 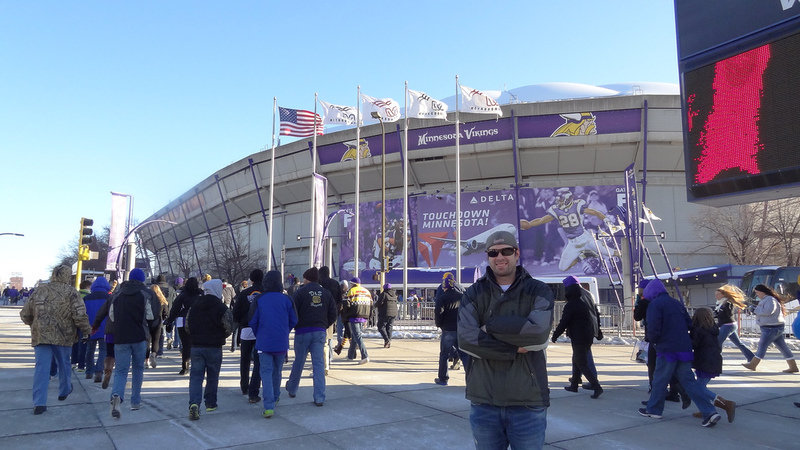 I was indifferent towards the Vikings as well. The Metrodome just became our summer spot to catch baseball (Minneapolis was a 12-hour drive from my hometown of Billings, MT). I was just happy to be one of the lucky few of my friends to regularly see major professional sporting events. So, when I found out the era of the Metrodome was finally coming to an end this season, I made it a point to get tickets to the final game. My girlfriend, Breeah, a Minnesotan-for-life and a diehard Vikings fan, had never seen the Vikings play. 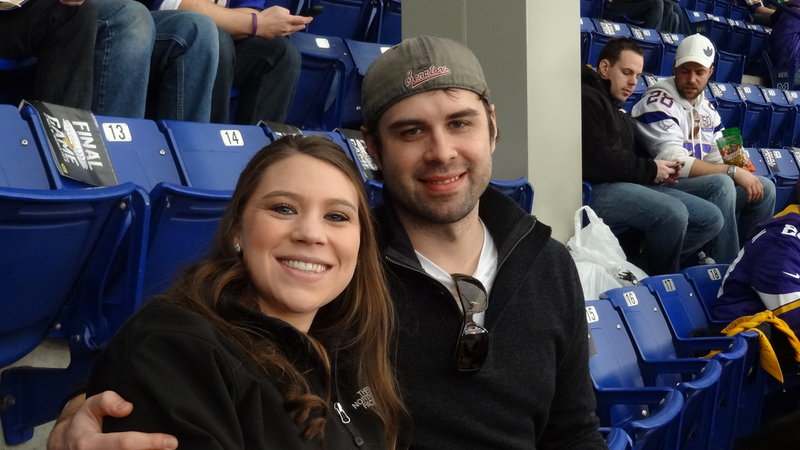 If we didn’t get tickets for this one, she was going to miss out on ever seeing the Vikings in the Metrodome. I just couldn’t live with that! 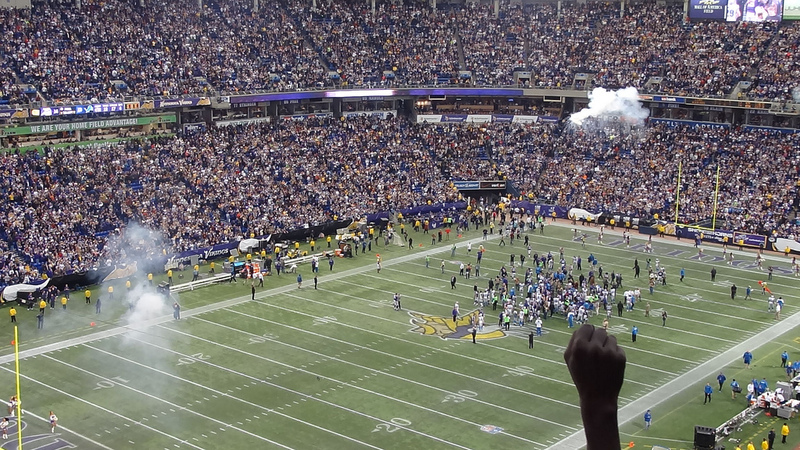 A fan raises a fist in triumph as the Vikings walk out of the Metrodome one last time as winners. December 29, 2013. Vikings 14, Lions 13. 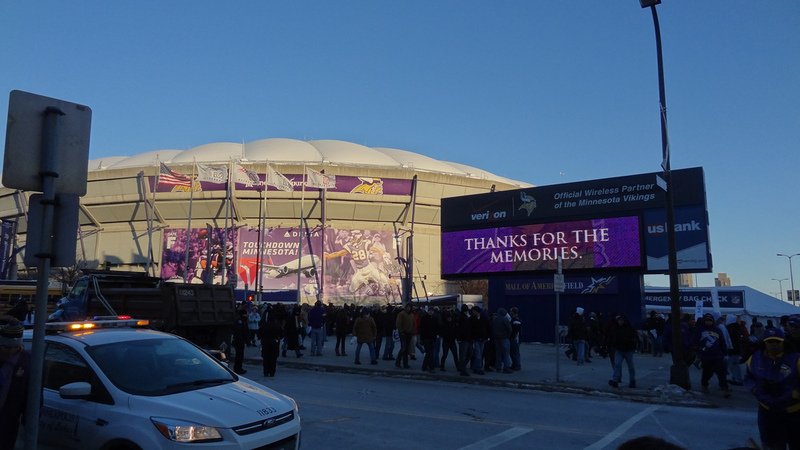 That will go down as the final farewell to the Metrodome. The weather was suitably frigid for the final contest, but that was the whole point of building a domed stadium (I can’t imagine how cold its going to get when they have outdoor home games next November and December at the University of Minnesota). The game itself was rather unremarkable, two below average teams with nothing but pride to play for. Only the score itself was up in the air, the outcome of these teams seasons already decided as well as the outcome of the Metrodome itself. I think a majority of us were there just to make sure we sent off the stadium in style. Stadiums come and go, more often now than in the past. My two childhood baseball parks are now gone (I can’t tell you how many games I saw at Cobb Field in Billings, which was demolished in 2007) and I’m only 31. Gone is Memorial Stadium in Baltimore, where I witnessed Wilson Alvarez’s no-hitter in 1991. Gone is the Kingdome in Seattle where I also saw Griffey hit a home run. Gone is Denver’s Mile High Stadium, where I was crushed by a John Elway last second touchdown pass to Rod Smith to beat the Redskins in 1995. In fact, D.C.’s RFK Stadium is the only structure still remaining that I attended games at at a young age. It’s all changed, and I suspect that when I turn 40 in 2022, I’ll only look back at more change. Thanks for the tidbit Jed, I remember his name now that you mention it. I also remember we ran into you before a game there once, talk about crazy odds – two people from Billings, MT visiting and taking in a game at the same time.